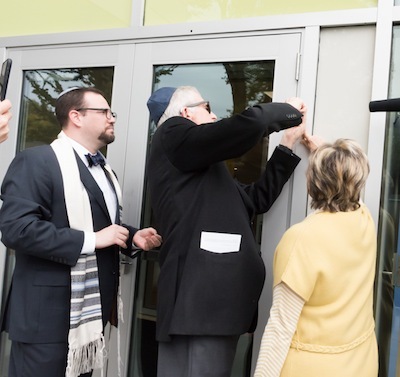 Vancouver Talmud Torah recently completed a comprehensive redevelopment and renovation of its campus and, on Sept. 25, a ceremony was held in the new double gymnasium of the school to officially open the new building. Members from all parts of the community came out to see the space the school has been touting as embodying “the concepts of 21st-century learning.” The event included an introduction by Cathy Lowenstein, head of school, as well as words from the campaign chairs, Dan Pekarsky and Alan Shuster. While thrilled at having reached the goal of $20 million in their first campaign, they hope that enthusiasm for the new school will spur the community to give additional financial support. Rose and Fred Mikelberg came to scout the space with their 2-year-old granddaughter. “She’ll be here next year. It’s exciting and such a beautiful building,” said Rose Mikelberg. One of the hallmarks of this modern building is the flexibility of space both for school purposes and potential rental. The spacious common areas, flooded with natural light, include a dining area adjacent to the kosher kitchen. It overlooks the gym and can be used as a viewing area for sports events or as a secondary area if someone wanted to host a large party. Open spaces between classroom “pods” (age-related clusters of rooms) serve as informal meeting places for students as well as places to engage in class group work. “Judaic offerings is an area that we know we must improve,” acknowledged Lowenstein, saying that having a new school rabbi, Rabbi Marc Kasten is a step in that direction. A trip that Grade 7 students will take to the Museum for Human Rights in Winnipeg for the first time this year is another. “We are the first elementary school in Canada to do a trip like this and we’re very grateful to the Asper Foundation, Diamond Foundation and Federation for their financial support, without which it wouldn’t be possible,” said Lowenstein. Other new programs the expanded school will be able to support include after-school basketball, floor gymnastics, musical theatre, mixed media art, hip-hop and jazz for girls, floor hockey, badminton, field hockey and STEM Lego robotics. 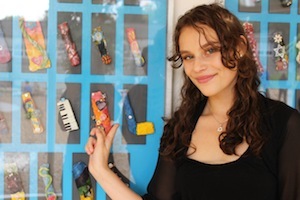 All of these programs are offered at market cost to students interested in these extracurricular activities. The learning commons area is open after school until 4:30 p.m. for what Lowenstein described as parents needing after-school options at low or zero cost. The new classrooms are enormous, with some of the latest educational technology. Students have access not only to two full-sized gyms but also a turf-covered playing field that covers the entire roof of the new building.